The Comet Group today opens Lab One in San José, California, its first technology and application center. The center’s purpose is to facilitate innovations, stimulate new applications and make the collaboration with customers more agile. For the first time, customers now have direct access to all three of the Group’s core technologies under one roof. Lab One gives customers direct and rapid access to numerous testing and inspection services based on radio frequency power technology, x-ray technology and ebeam technology. The new application center also streamlines customers’ collaboration with the Comet Group’s industry experts. With the opportunity for direct consultation and brainstorming on site, Lab One represents an attractive resource for many leading Silicon Valley firms for the development of new solutions. Radio frequency (RF) power technology, provided by the Plasma Control Technologies segment, enables the control of plasma processes – and thus the manufacturing of the touch screens and memory chips that today are used in everything from sensors, personal computers, smartphones and tablets to large server farms. Leading chip manufacturers in the smartphone industry and top companies in the electronics sector rely on the advanced technology from Comet. X-ray technology: Whether in the electronics sector or in medical technology, at research institutions or in the automotive and aerospace industries: The industrial x-ray and computed tomography systems from Yxlon and the compact Comet x-ray sources empower customers from a wide array of industries to improve their products and processes through non-destructive testing, metrology and decision support. ebeam: Thanks to the innovative ebeam technology, surfaces can be treated in ways that save resources. Using electron beams, the technology inactivates harmful microbes that can cause food-borne illnesses. It also supports the production of safe and environmentally friendly packaging materials through solutions for food-safe digital printing. 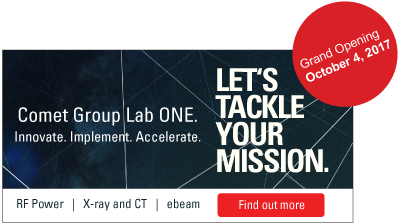 The Comet Group is a globally leading, innovative Swiss technology company with a focus on the x-ray, radio frequency and ebeam businesses. With premium high-tech components and systems, we enable customers in numerous industries to both enhance the quality of their products and make their manufacturing more efficient and eco-friendly. Our innovative solutions under the Comet, Yxlon and ebeam brands are in demand for applications such as materials testing and security inspection, the coating and treatment of surfaces, and non-contact sterilization. Based in Flamatt, Switzerland, the Comet Group has a presence in all world markets. We employ about 1,300 people worldwide, including almost 500 in Switzerland. Besides production facilities in China, Denmark, Germany, Switzerland and the USA, we maintain various subsidiaries in the USA, China, Japan and Korea. Comet’s stock (COTN) is listed on the SIX Swiss Exchange.